LEXINGTON — Louise Cady-Fernandes was almost always good at swimming. She earned national ranking as a teenager in her tiny hometown of Youngstown, N.Y., near the Canadian border, held the state record for the 50-yard freestyle, and won a scholarship to Boston University, where she swam for two years before calling it quits. Cady-Fernandes turned her focus to school, graduating from BU in 1983 with a degree in early childhood education and taking a job as a teacher at a Brookline nursery school. She met Tom Fernandes while waiting for a train at Park Street station. They married in 1988 and had their first daughter, Caroline, in 1991 and their second, Julia, in 1993. The years passed; the kids grew up. Cady-Fernandes changed jobs a couple of times. About a decade ago, Cady-Fernandes started having nagging thoughts about returning to competitive swimming. She eventually decided to take a chance and is once again nationally ranked — as well as being an entrepreneur and blogger. But her path was anything but direct. Sipping herbal tea at the wooden kitchen table in her Lexington home at the end of a quiet street one recent afternoon, Cady-Fernandes talked about how thoughts of returning to swimming began to surface when she turned 40. “Swimming was something I loved for so long, but things ended on a bad note at BU,” she said, citing the time commitment, the intense level of competition, and her inability to focus on academics. But now she was hip-deep in family and financial responsibilities. “The kids were 8 and 9, I was commuting into Boston . . . I realized it wasn’t the right time,” she said. An avid knitter, Cady-Fernandes left teaching to work for a Swiss yarn company, and then in the design department of a knitware firm. “I didn’t go to art school or anything, but I had a love of knitting and a knack for design,” she said. In 2006 Cady-Fernandes saw trouble ahead. Her company was on a downward spiral, and she feared it would soon be out of business. She started her own small online company, The Hole Thing, that sells felted wool products such as sweaters, hats, scarfs, and other accessories. Four years later, with her business up and running, Cady-Fernandes decided that it was time to give swimming another try. She began by working out several times a week in a neighbor’s pool over the summer before she turned 50. 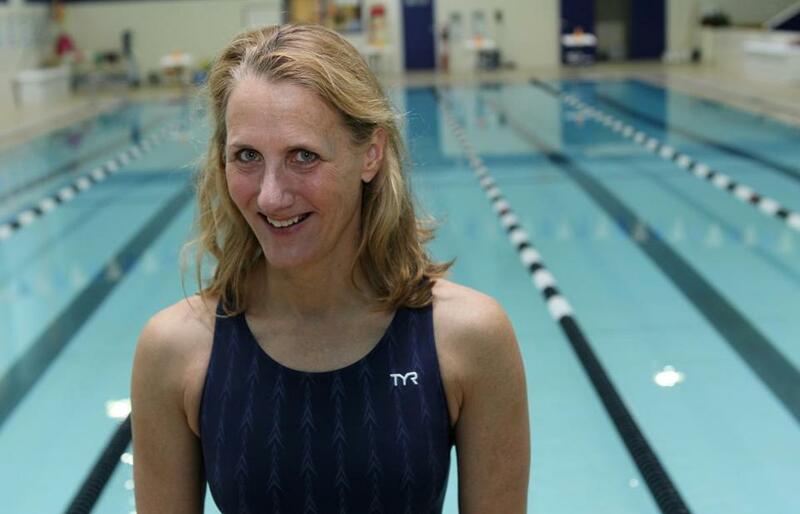 That September, she joined the Minuteman Masters Swim Club and began formal training. She surprised herself, though, returning to form quickly and winning races in her age group (50-54) in her very first year at meets throughout New England. Three years later she is “ranked fourth in the US for the 50-meter short course [which includes a flip turn] in my age group and fifth for the long course [no flip turn],” she said. At a world championship meet in Montreal this year, Cady-Fernandes placed sixth in the 50-meter freestyle competition in her age group. Her high school swim coach, James Grapes, retired now and living in Pawleys Island, S.C., is not surprised. “She had a swimmer’s heart, and she still holds school and pool records back home,” Grapes said. Exploring that mind-body connection has taken Cady-Fernandes in a new direction in recent years, resulting in a popular blog on aging naturally. In the period before her return to swimming, Cady-Fernandes had found herself reflecting on where she was in life and increasingly frustrated with the barrage of anti-aging messages in the media and elsewhere. “I’ve been watching my mom, who is 92, age so beautifully all these years, and when I went looking for somebody to be my mentor in the aging process. I couldn’t find anyone or anything,” she said. Determined to do something about it, she launched her Lines of Beauty blog, which is still going strong, drawing 200-400 hits a week. Some recent posts include observations about the challenges and triumphs of aging, occasional guest bloggers, and video clips that range from Ali MacGraw telling Oprah Winfrey why she let her hair go gray to an “angry yoga” parody. “She focuses on how, as we get older, we get more beautiful in so many ways, which is an important message in a culture that worships youth,” said Terry Lee Cafferty, 56, a children’s portrait photographer and regular reader from South Kingstown, R.I.
Cady-Fernandes says she has been humbled by the positive response to her blog and that her experiences in returning to the pool have taught her much.